A research team has discovered the process – and filmed the actual moment – that can change the body’s response to a dying cell. Importantly – what they call the ‘Great Escape’ moment may one day prove to be the crucial trigger for autoimmune diseases like arthritis. The research team, led by Professor Benjamin Kile from Monash University’s Biomedicine Discovery Institute (BDI), has discovered – and filmed – the exact moment when DNA escapes out of the mitochondria (the organelles inside cells that produce energy) during cell death. The study, published today in the journal Science, involved major collaborators from the Walter and Eliza Hall Institute and the Howard Hughes Medical Institute’s Janelia Research Campus in the US. Mitochondria are the ultimate double agent; they are essential to keep cells alive, but when damaged, they can trigger the body’s own immune system with potentially devastating consequences. Because the DNA inside mitochondria (mtDNA) has many similarities with bacterial DNA (they share common ancestry), the body reacts to its presence outside the mitochondria, or indeed, outside the cell, as if under attack from invading pathogens. It is a similar failure to distinguish ‘self’ from ‘non-self’ that underlies inflammatory and autoimmune diseases. While the release of mtDNA is thought to contribute to autoimmune diseases such as lupus, how it escapes from the mitochondria has never been explained. Monash BDI researcher Dr Kate McArthur, while completing her PhD at the Walter and Eliza Hall Institute, used a revolutionary new microscope at the Janelia Research Campus in the US to capture the moment when mitochondria form a ‘hernia’ that balloons out of the mitochondria expelling the DNA into the rest of the cell. “As scientists, we are taught to be quite sceptical when we see something unexpected, so I think my initial reaction was ‘no way…’ It was only after I had carefully repeated the experiment many times that I began to realise what we had found,” Dr McArthur said. According to Professor Kile, when a cell commits suicide (a normal part of the human body’s balancing act to control blood cell numbers) two proteins called BAK and BAX are triggered. “What we witnessed – in real time – was these professional killer proteins opening up huge ‘macropores’ in the outer membrane of the mitochondria, leading the inner contents to herniate out, bringing the mtDNA with it,” Professor Kile said. “BAK and BAX deliver the “kill shot” designed to permanently disable the cell. But in doing that, mtDNA is lost from the mitochondria. In essence, this is collateral damage, which, if it isn’t controlled properly, triggers the immune system to drive pathological inflammation,” he said. The discovery was cemented by images captured by Monash University’s Titan Krios cryo-electron microscope, currently the most advanced microscope for biological electron microscopy, and the Walter and Eliza Hall Institute’s new lattice light-sheet microscope, custom built by collaborators in the Institute’s Centre for Dynamic Imaging. 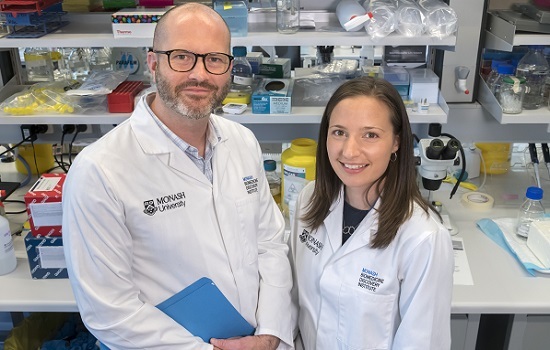 Professor Kile stressed that in research “Fundamental discoveries such as this are rare, and this one has profound implications for the understanding of a wide range of autoimmune diseases and infections. This has been a brilliant collaboration – between Monash’s Biomedicine Discovery Institute, the Walter and Eliza Hall Institute of Medical Research here in Melbourne and the Janelia Research Campus in the US – which has brought together cutting-edge technologies and first-class expertise to address questions that before now, had never been asked, and would have been impossible to answer”. Mitochondrial DNA (green) escaping mitrochondria (red) during cell death. Mitochondrial DNA (green) escaping mitrochondria (red) during cell death captured by Dr Kate McArthur (Monash BDI) and Dr Lachlan Whitehead (WEHI) and The Advanced Imaging Centre at Janelia Research Campus. Attribution: Dr Kate McArthur (Monash BDI) and Dr Lachlan Whitehead (WEHI) and The Advanced Imaging Centre at Janelia Research Campus.